Five mid-day meals your kids won’t trade up. 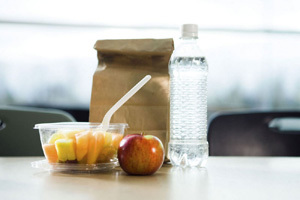 It’s well into the school year, and you’re scrambling to keep your child’s lunch desirable. But making easy, tasty, healthy and inexpensive meals is no small feat. With the following suggestions, however, you’ll be packing the best brown bag lunch on the block in no time. Use last night’s leftovers. As you are cleaning up dinner, make tomorrow’s lunch by incorporating some food from supper. For example, wrap up leftover chicken in a soft whole-wheat tortilla. Place any sauces and toppings, such as ranch dressing and lettuce, in separate and reusable containers, which are great for dipping and keeping things neat. Deconstruct lunch. They may be a chore for you to prepare, but compiling homemade lunches at school can be a lot of fun for kids. Pack the ingredients for the mid-day entrée, and let your little muncher put everything together at school. Try cubed or sliced ham or chicken, cubed or sliced cheese, whole-wheat crackers, sliced cucumbers and a condiment. Your child can get creative assembling the lunch. Go untraditional. Though peanut butter and jelly is a lunchtime staple, it can get boring pretty quickly. Change it up by using fresh strawberries rather than jam or jelly, or replacing jam with honey. For younger kids, use cookie cutters to make shapes out of their sandwiches. Create it slightly homemade. Use one pre-cooked ingredient and brainstorm original recipes. A store-bought rotisserie chicken can be a big time and money saver. It can also provide variety to your child’s lunchbox. Five meals to make using a rotisserie include chicken salad with cranberries, chicken soup in a small thermos, chicken tacos in a soft tortilla, a chicken quesadilla served cold and a buffalo chicken wrap. Swap food. Dinner swaps, where one family makes dinner and trades it with four other clans, are growing in popularity. Why not organize a lunch swap? Identify four other houses from your child’s class, and arrange to pack lunch just once per week for your child and the other four children. Discuss food allergies and aversions, as well as budgets and calendars beforehand. Lunch swaps expose kids to more foods and recipes than if they were just bringing traditional bagged lunches. Jason Hutchinson is the executive chef of Boloco, a Boston-based group of 17 restaurants located throughout New England. Boloco was the first chain of restaurants in New England to become Certified Green by the Green Restaurant Association. For more information, visit www.boloco.com.